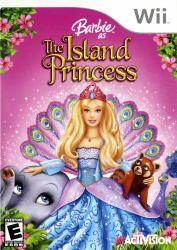 Barbie as The Island Princess follows the storyline of the popular DVD launch in a fun party-style format. You'll play as rosella�, the shipwrecked princess, who is raised by a "family" of animal friends and rescued by the adventurous Prince Antonio� from her tropical island. Through a series of mini-games oined by music and characters from the movie, you will venture from Rosella's island home to the Prince's coastal castle in a fun filled adventure!